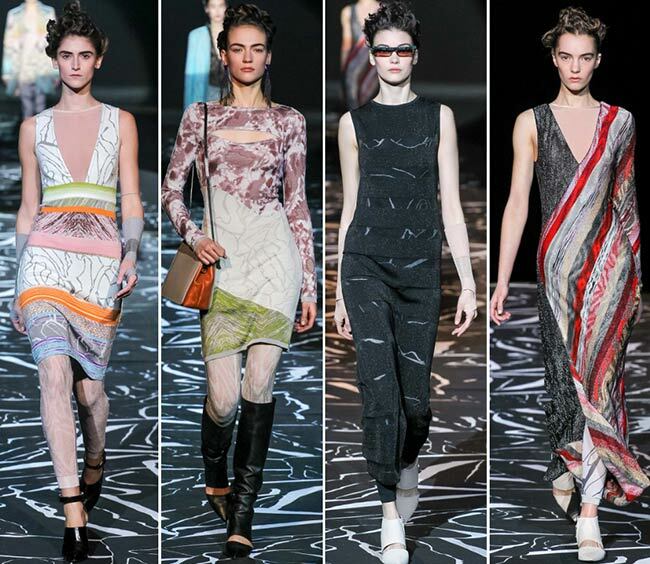 A high end Italian fashion house based in Varese, Missoni is very much known for its knitwear designs. Founded by Ottavio and Rosita Missoni in 1953, the brand has grown immensely over the years and has also brought to the world plans for the Hotel Missoni and established a line for the home products it produces. Starting with knitwear near Rosita’s home village it began its take off when they were invited to the Pitti Palace to showcase their designs and Rosita had the models remove the bras they were wearing, essentially making the material almost transparent under the lights, causing quite the sensation. Angela Mossini has taken over the fashion end of the business and she presents a rather intriguing collection for the Milan Fashion Week runway on the second last day of the shows. 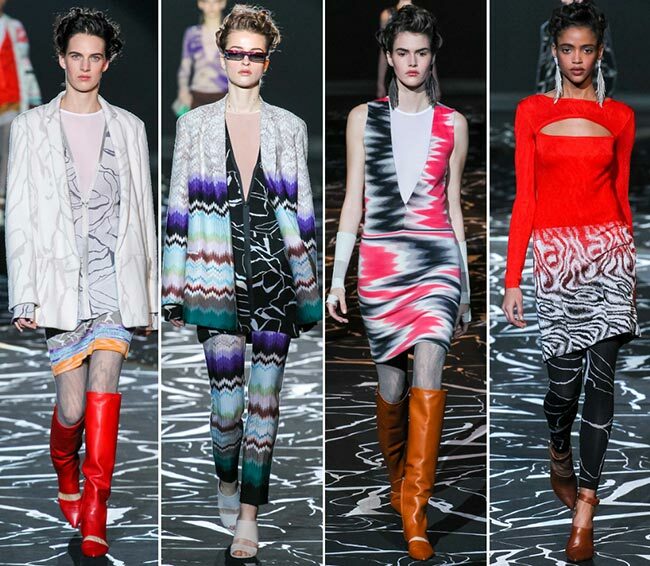 The Missoni fall/winter 2015-2016 collection was designed with the neo-body conscious Missoni woman in mind, clad in tight knit dresses, bodysuits, wrap shirts and short skirts, all of which is layered over leggings. 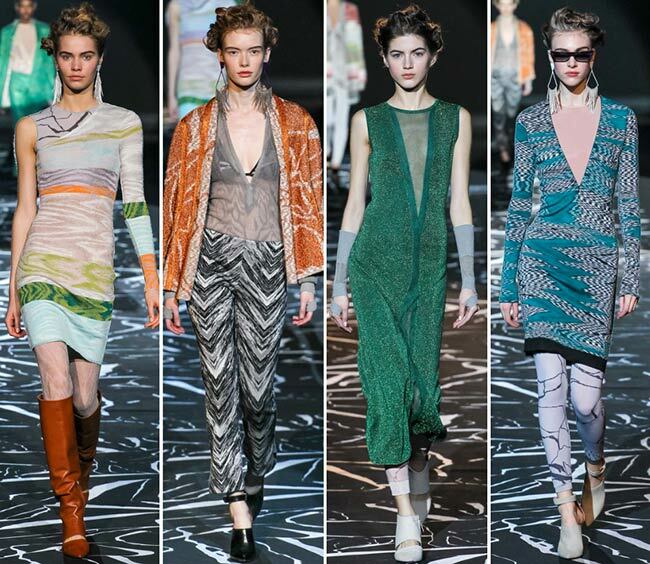 Just as some of the other brands showing off their collections on these last days of the Fashion Week, Missoni also brings the focus to the 1980s instead of a decade before as has been the inspiration for the 2015 fashions, giving the knits cut-outs and single shoulders, as well as marbled and static patterns alongside the clashing colors. We are given witchy purple, gentle brown, sunshine yellow and stark white; there is pure black and light olive green, classic red and coral pink; there are boots that appear in burnt coppery orange, with a touch of royal blue on the fingerless gloves; we are treated to teal accents as well as sky blue trouser and blazer sets; there is darker green mixed with the rest as well as some pastel colors of lighter green and pink. The pieces are gorgeous for the most part and the marble effects certainly capture our attention. The plunging V-necks of some of the garments fit well with the season’s trends, while the ankle cropped pants were some of the best pieces on the scene. It is such a different collection, both from all the others, despite the fact that it does include some of the season’s bigger trends, and for the fashion house itself. For some, it was not quite satisfying, but for us, it was a breath of fresh air and something uniquely interesting to captivate our senses while still allowing us to appear to be as stylish as all the rest. 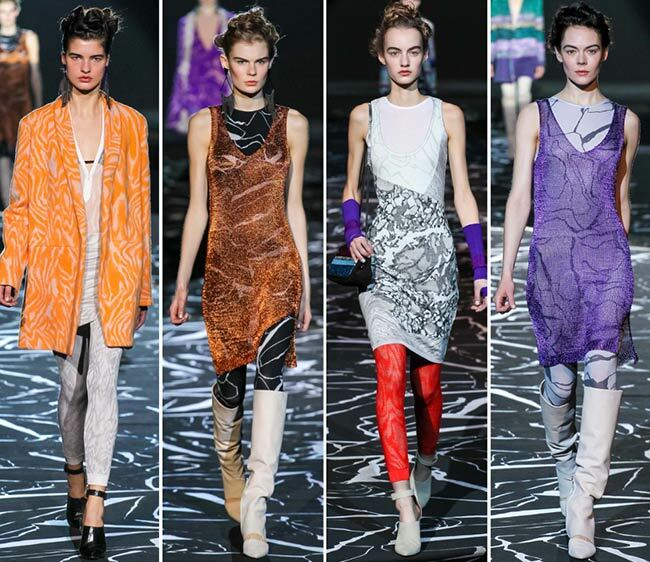 Tube dresses and leggings are always something to covet, though it would have been nice to see a few more rich textiles among the mix. 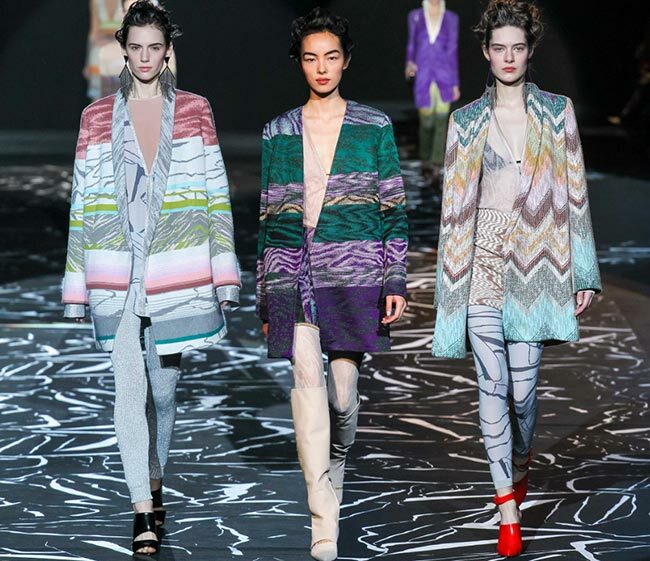 We found oversized boyfriend jackets in soft cuts of looser stature and pastel Missoni zigzags, while the bolder red on red styles were especially appealing. At the end of the day, it was most certainly the pale white and gray marbled look that had us smiling indulgently as we watched the models sashay down the runway, sporting pieces that look as lovely as the women themselves.